The heart is composed of three major types of cardiac muscle: atrial muscle, ventricular muscle and specialized excitatory and conductive muscle fibers. It is a hollow, muscular pump with four cavities, each provided at its outlet with a valve, whose function is to maintain the circulation of the blood. The heart beats at the rate of 72 per minute in a healthy adult, with the rate of respiration being one-fourth. The blood is pushed out through the arteries, returns through the veins, and is then sent out again. The circulation of the blood in the body is completed in 15 seconds. The main causes of heart disease are the diseases of the coronary arteries (which nourish the heart muscle), high blood pressure and syphilis. Acute rheumatism - a predominantly infantile disorder is responsible for most cases of heart disease occurring between the ages of 5 and 45 years. Other causes of heart disease are disorders like diphtheria, diseases of the thyroid gland and certain forms of chronic lung ailments. A small, but important group of heart diseases is due to the congenital abnormalities of the heart. In those disorders for example, the malformation of valves or cavities in the valve developed in the Mother's womb, the only recourse is to heart surgery. Certain deficiency diseases like gross lack of Vitamin B cause the condition known as beri-beri. The tendency of the heart to adjust the changes in the mode of living of its owner, known as compensation, is one of the vital factors which prolong life in spite of maladies to which the king of organs is susceptible. This adjustment sometimes enables a person to go through life without suspecting the disease which invades the heart. It is a common fallacy to suppose that heart disease ends in sudden death. A man with a defective heart may live long, if he is careful. It is only when the heart muscle has become weakened due to some other illness, for example, diabetes, that the end may come suddenly. Another cause of sudden death by heart failure can be ascribed to the formation of a clot in the blood (thrombosis). Hardening of the arteries may lead to failure of the heart, but in most cases that is a gradual improvement. According to Oriental Medicine, the heart, not the brain, is the seat of consciousness. It is the site of the 'Atman', the true or Divine Self. How we feel in our hearts is the measure of who we really are. This thought is found in the Upanishads, the great ancient scriptures of India. What we think in our heads is often no more than a superficial impression, passing momentarily through us, via the senses. Hence, heart diseases reflect deep-seated issues of identity, feeling and consciousness. Many of us literally die of broken hearts or spiritual starvation, even those who may outwardly appear successful. We can be so driven by achievement that we deny our hearts, which then fail owing to our neglect of them. The American diet that concentrates on sweet and salty food, animal fat and fried food makes us culturally prone to heart-attacks. So, do our lifestyles which are sedentary and sluggish, lacking proper exercise or ventilation. Heart diseases include heart attacks, stroke, angina, arteriosclerosis and hypertension. Heart attacks, the end result of most heart diseases, are preceded by palpitations, insomnia and numbness or severe pain in the chest or middle back that radiates down the arms. Other indications are cyanosis (blue color of lips and tongue), loss of consciousness, fever, cough, hiccup, shortness of breath and vomiting. Causes of heart disease include wrong diet, physical or emotional trauma, congenital or hereditary factors, suppressed emotions or excess strain and anxiety. It may occur as the complication of other diseases (rheumatic diseases or liver disorders). As the heart is an organ of emotion, emotional causes should be always considered first. These includes difficulty in work or relationships, usually indicating that on an inner level we are not in touch with our own hearts. They may show insensitivity to the hearts of others. Most coronary heart disease is Kapha in nature, reflecting overweight and stagnation in the tissues and organs. Yet as Pitta relates to the blood, heart disease, particularly involving hypertension, is commonly, a Pitta disorder. Vata type heart disease is more common in the elderly, where there is drying out of the tissues and hardening of the blood vessels. Kapha type occurs mainly from overeating and the accumulation of mucus, fat and cholesterol that obstruct heart functioning. Those caused by inflammation of the muscle , the outer covering or inner covering of the heart. Weakness of the muscle or degeneration of the organ because of advancing years. Functional disorders like tachycardia, bradychardia, hypertension, arrhythmia and angina pectoris. Heart diseases can be managed under this system of medicine. The only exception that it may be stated here, is congenital defects of the heart for which surgical interference is necessary after the 'compensation' fail to relieve the condition. Ancient Ayurvedists recognized the heart as one of the most important organs in the body. The main symptoms produced due to its malfunctioning included generalized weakness, diminished appetite, swelling all over the body, breathlessness, fast respiration and pulse. It was also known that malfunctioning of different parts of the heart caused other specific symptoms such as constriction in the chest or pain in the chest. The detailed working of the heart and the diagnostic procedures for pin-pointing the defective part of the heart are the contribution of Modern Researchers. The classification of the disease of the heart into congenital or acquired; those of the endocardium, myocardium and pericardium; various disorders relating to the conduction of electrical impulses and the production of heart beats, is a modern phenomenon. So also is the fact that the circulation of blood in the coronary arteries nourishes the heart muscle, and its deficiency leads to diseases like angina pectoris, coronary heart disease and heart attack. According to Ayurveda, when vayu is vitiated and disturbs the balance of Rasa Dhathu in the body, the various diseases of the heart are born. Ayurveda believes that heart disease may be caused by the vitiation of vayu, pitta, Kapha or all the three doshas taken together, along with certain organisms. High blood pressure or hypertension to give its proper medical name, is the most common form of high blood pressure. Its causes include kidney disease, disorders of the endocrine glands and malfunctioning or disorders of the arteries. A congenital abnormality of the aorta is one of the most serious forms of hypertension. Its chief symptoms are headache, usually in the back of the head, ringing in the ears and giddiness. Headache is worst at the time of waking in the morning and it has a tendency to wear off during the day. While hypertension runs its natural course, it usually causes death in the end as a result of heart failure. A proportion of the victims die of kidney failure and some of a stroke. Hypertension can be either functional or organic: the latter is the case when the fatty substances accumulate in the smaller arteries carrying blood to the heart. The openings being smaller, the heart has to beat faster and exercise more pressure to supply the blood to the various organs. Hence the higher blood pressure. Hypertension is a disease of the modern civilization. Its incidence has increased during the last fifty years. The fast pace of life, the mental and physical pressures under which man in the present industrial and metropolitan environment works, gives rise to psychological tensions. Worry is known to increase the adrenalin in the blood stream which causes the pressure of the blood to go up. Difficulty in breathing may be experienced by persons suffering from hypertension. A healthy person should have a systolic pressure of 120 mmHg and a diastolic pressure of 80 mmHg. The blood pressure is accurately measured by an instrument known as Sphymgomanometer. The pressure, if it is abnormally high, is accompanied by disease of the arteries. Kidney diseases, hardening of the arteries and severe constipation leading to absorption of morbid humors through the gut lead to high blood pressure. Smoking is another addiction which leads to hypertension. The best way to treat is to remove the real cause. Include more vegetables and fruits in your diet. Have a low salt diet. As the blood pressure shows signs of abating, take more exercise. Avoid too much straining of the heart. Breathe deeply while you are walking or taking exercise. Early to bed is another cardinal principle which a person suffering from hypertension must follow. He should get eight hours of restful sleep. Those who find it difficult to sleep can keep their feet in warm water for 10 to 15 minutes and then wash them with cold water. The patient must avoid over-straining, worries, tension, anger and haste. The Arjun Saar or Arjun Tea is also helpful in curing the Kidney disease. A high blood pressure shows its effect on the Kidneys. Sometimes due to elevated blood pressure, the Kidneys fail to function properly. This herbal tea maintains a normal blood pressure. Low blood pressure or hypotension refers to the fall in blood pressure below normal. It is a condition in which the action of the heart, in forcing the blood through the arteries, is weak. This is a direct outcome of a weakened and devitalized system. The most important cause of low blood pressure is faulty nutrition. It makes the tissues forming the walls of the blood vessels over-relaxed, flabby or stretched. This results in less supply of oxygen and nutrients to the tissues. The patient with chronic low blood pressure may complain of lethargy, weakness, fatigue, and dizziness. The patient may faint, especially if arterial pressure is lowered further when he assumes an erect position. These symptoms are presumably due to a decrease in perfusion of blood to the brain, heart, skeletal muscle and other organs. Sometimes the blood pressure falls rapidly because of loss of blood. Low blood pressure may also develop gradually because of slow bleeding in the gastrointestinal tract, kidneys or bladder. Emotional problems are a far more frequent cause of low blood pressure. All living habits which tend to enervate the system, such as overwork, excesses of all kinds, needless worry and negative thinking must be eliminated as far as possible. The term coronary heart disease covers a group of clinical syndromes arising particularly from failure of the coronary arteries to supply sufficient blood to the heart. This is?a disease that badly affects the walls of the blood vessel. They include Angina Pectoris, Coronary Thrombosis or myocardial infarction (heart attack) and sudden death without infarction. A common symptom of heart disease is shortness of breath, which is caused by the blood being deprived of the proper amount of oxygen. Another common symptom is chest pain or pain down either arm. Other symptoms are palpitations, fainting, emotional instability, cold hands and feet, frequent perspiration and fatigue. Elevated blood levels of cholesterol, triglycerides and other fatty substances. Each or a combination of these risk factors can contribute to heart disease. most of them are dietary origin. Constant worry and tension stimulate the adrenal glands to produce more adrenaline and cortisone. This also contributes to constricted arteries, high blood pressure and increased work for the heart. Vitamin C is also essential as it protects against spontaneous breaches in capillary walls which can lead to heart attacks. It also guards against high blood cholesterol. The stress of anger, fear, disappointment, and emotions can raise blood fat and cholesterol levels immediately but this reaction to stress can do little harm if the diet is adequate in vitamin C and pantothenic acid. One of the richest sources of vitamin C is Amla. A person suffering from heart disease should eat fat-free foods which can be easily digested. It would be better if the patient can take a salt-free diet. Liquid diet comprising vegetables and meat soups; juices of fruits and even vegetables, such as carrots should be taken. The best regimen would be a diet of boiled vegetables, free from salt and other condiments. A strict regimen must be prescribed for a person suffering from any heart ailments. He should never strain his heart; after an attack, he must be given complete bed rest. Exertion of any type should be prohibited. After the attack has passed, he can be allowed to go for walks. Care should be taken that his bowels remain clear so that no flatulence forms in them, as it is likely to depress the diaphramg which, in turn can give rise to cardiac complaints. Immediately after an acute coronary occlusion, blood flow ceases in the coronary vessels beyond the occlusion except for small amounts of collateral flow from surrounding vessels. The area of the muscle that has either zero flow or so little flow that it cannot sustain cardiac muscle function is said to be infracted. The overall process is called a myocardial infarction. Soon after the onset of infarction, small amounts of collateral blood seep into the infarcted area, and this, combined with progressive dilatation of the local blood vessels, causes the area to become overfilled with stagnant blood. Simultaneously, the muscle fibers use the last vestiges of oxygen in the blood, causing the hemoglobin to become totally reduced and dark blue. The infarcted area takes on a bluish brown hue and the blood vessels of the area appear to be engorged despite the lack of blood flow. In later stages, the vessel walls become highly permeable and leak fluid, the tissue becomes edematous, and the cardiac muscle cells begin to swell because of diminished cellular metabolism. Within a few hours of almost no blood supply, the cells die. Cardiac muscle requires about 1.3 milliliters of oxygen per 100 grams of muscle tissue per minute to remain alive. This is in comparison with about 8 milliliters of oxygen per 100 grams delivered to the normal resting left ventricle each minute. Therefore, if there is even 15 to 30 percent of normal resting coronary blood flow, the muscle will not die. In the central portion of the large infarct, however, where there is no collateral blood flow, the muscle does die. After a heart attack, many other recommendations may be made including changes in diet, lifestyle, stopping smoking and so on. The aim of these is to try to reduce the chance of having another heart attack. If specific conditions are discovered that have contributed to the heart attack, like high cholesterol or high blood pressure for example, then specific treatments might be needed for these. In most people who develop progressive constriction of their coronary arteries, cardiac pain, called angina pectoris, begins to appear when the load on the heart becomes too great in relation to the coronary blood flow. This pain is usually felt beneath the upper sternum and is often referred to the surface areas of the body, most commonly to the left arm and left shoulder but also frequently to the neck and even to the side of the face or to the opposite arm and shoulder. It is characterized by a sharp pain in the chest (behind the sternum) which leaves the victim breathless. There is a sense of impending doom. It is generally caused by the constriction of the main artery that leads into the heart, because of its hardenings or deposition of fat in the insides. The pain radiates to the back, the shoulders and the arms, particularly the left arm. The attack may come on after a hearty meal, a sudden over-exertion or intense grief or excitement. The true pain of angina has a tendency to spread to the shoulders and arms. There is a constriction in the chest and profuse sweating. True angina must be differentiated from false or pseudo-angina which is of a nervous origin. Drugs taken to relieve angina only help to make the condition more chronic. Patients taking recourse to traditional methods of treatment would be seen carrying tablets of nitro-glycerine to relieve the pain. The drug may be taken in an emergency but the correct treatment for angina begins when it is aimed at building the general level of the patient. Most people who have chronic angina pectoris feel the pain when they exercise and when they experience emotions that increase metabolism of the heart or temporarily constrict the coronary vessels because of sympathetic vasoconstrictor nerve signals. The pain usually lasts for only a few minutes. However, some patients have such severe and lasting ischemia that the pain is present all the time. The pain is frequently described as hot, pressing and constricting. It is of such quality that it usually makes the patient stop all activity and come to a complete state of rest. The reason for this distribution of pain is that the heart originates during embryonic life in the neck, as do the arms. Therefore, both of these structures receive pain nerve fibres from the same spinal cord semgents. When an attack is on, the best thing is to apply hot towel over the heart region. That will relieve the constriction around the chest by dilating (through heat) the clogged artery which finds it difficult to pass the required amount of blood through it to the heart. Several vasodilator drugs, when administered during an acute anginal attack, usually give immediate relief from the pain. Commonly used vasodilators are nitroglycerine and other nitrate drugs. A second class of drugs that are used for prolonged treatment of angina pectoris is the beta blockers. They block the sympathetic beta receptors, which prevents sympathetic stimulation of heart rate and cardiac metabolism during exercise or emotional episodes. Therefore, therapy with a beta blocker decreases the need of the heart for extra metabolic oxygen during stressful conditions. For obvious reasons, this can reduce greatly the number of anginal attacks as well as their severity. Arjuna is the most effective Ayurveda herb in the treatment of angina pectoris. The bark of the tree is known to have a stimulant action on the heart. An aneurysm is an abnormal or balloon like bulge in the wall of the artery. It can occur in any arteries irrespective of the size. An aneurysm occurs when the pressure of blood passing through part of a weakened artery forces the vessel to bulge outward, forming what you might think of as a blister. Not all aneurysms are life threatening. But if the bulging stretches the artery too far, this vessel may burst, causing a person to bleed to death. An aneurysm that bleeds into the brain can lead to stroke or death. Aneurysm can occur in the cerebral arteries or in the heart's main pumping chamber, the left ventricle. In parts of the large vessel that carries blood from the heart to other parts of the body (the aorta). The aorta is the largest artery in the body. It carries oxygen rich blood directly from the heart. All arteries in the body arise from the aorta or other arteries that are branches of the aorta. Aortic aneurysms can occur in the area below the stomach (abdominal aneurysms) or in the chest (thoracic aneurysms). An abdominal aortic aneurysm (AAA) is usually located below the kidneys. Pain in the chest, abdomen or in the middle of the back. Rupture of the aneurysm can cause unconsciousness, stroke or a heart attack. Patients with a complaint of Coronary artery disease or carotid artery blockage should undergo regular examinations and follow a healthy diet and lifestyle. Patients who are under stress, who have high blood pressure and the habit of smoking are more prone to aneurysm. The most common cause death in the western culture is ischemic heart disease, which results from insufficient coronary blood flow. About 35 percent of people in the United States die of this cause. Some deaths occur suddenly as a result of an acute coronary occlusion or of fibrillation of the heart, whereas others occur slowly over a period of weeks to years as a result of progressive weakening of the heart pumping process. The most frequent cause of diminished coronary blood flow is atherosclerosis. In certain people who have a genetic predisposition to atherosclerosis or in people who eat excessive quantities of cholesterol and other fats, large quantities of cholesterol gradually become deposited beneath the endothelium at many points in arteries throughout the body. Later, these areas of deposit are invaded by fibrous tissue and frequently become calcified. The net result is the development of atherosclerotic plaques that protrude into the vessel lumens and either block or partially block blood flow. A common site for development of atherosclerotic plaques is the first few centimeters of the major coronary arteries. Atherosclerosis is a disease of the large and intermediate-sized arteries in which fatty lesions called atheromatous plaques develop on the inside surfaces of the arterial walls. These plaques begin by deposition of minute crystals of cholesterol in the intima and sublying smooth muscle. With time, the crystals grow larger and coalesce to form large mat-like bed of crystals. In addition, the surrounding fibrous and smooth muscle tissues proliferate to form larger and larger plaques. The cholesterol deposits plus the cellular proliferation can become so large that the plaque bulges deeply into the lumen and greatly reduces blood flow, sometimes even to complete vessel occlusion. Even without occlusion, the fibroplasts of the plaque eventually deposit such extensive amounts of dense connective tissue that sclerosis (fibrosis) becomes so great that the arteries become stiff and unyielding. Still later, calcium salts often precipitate with the cholesterol and other lipids of the plaques, leading to bony hard calcifications that make the arteries at time rigid tubes. Both of these latter stages of the disease are called hardenings of the arteries. The factor most important in causing atherosclerosis is a high blood plasma concentration of cholesterol in the form of low-density lipoproteins. The plasma concentration of these high-cholesterol low density lipoproteins is directly increased by increased saturated fat in the daily diet. To a lesser extent, it is also increased by increased cholesterol in the diet. Therefore, both or either of these dietary factors can contribute to the development of atherosclerosis. By far the most important preventive measure against the development of atherosclerosis is to eat a low-fat diet that contains mainly unsaturated fat with low cholesterol content. Arjun Tea: Boil it with milk and water and have it in the form of tea. Healthy Heart Support: 2 capsules twice daily after meals with warm water. Regular use of Arjun Saar helps improves pumping activity of heart, strength of the cardiac muscle and decreases LDL and VLDL Cholesterols. Amla Saar, a powerful source of antioxidants reduces cholesterol and cholesterol induced atherosclerosis. It is a very good Remedy for Diabetes as well as Cardiac diseases. Do not panic. Start coughing repeatedly and vigorously. A deep breath should be taken before each cough. The cough must be deep and prolonged, as when producing sputum from deep inside the chest. A breath and a cough must be repeated about every two seconds without let-up until help arrives. Or until the heart is felt to be beating normally again. The patient should subsist on a diet of fresh fruit and vegetables. Salt should be avoided totally or taken in small quantities if the patient cannot do without it. Fatty portions of meat, particularly pork and beef should be avoided. He should never overload his stomach because distension of the organ by flatulence or overloading may depress the diaphramg and the pain of the angina may start. Sufferers from heart disease should fast for a short period according to their bodily strength so that the system is not overtaxed. Ailments like indigestion should not be allowed to arise as they are likely to tax the heart. A heart patient should eat so sparingly that he should feel hungry all the time. The last meal of the day should be taken at least three hours before retiring. A short walk in the morning and evening is beneficial. Many of the Doctors have come to realize now that walking is the best exercise for a heart patient. A medical fact about one should be aware of is that, when you are walking the pressure on the heart is reduced to some extent because the blood going back for purification through the heart to the lungs flow back more easily when you are walking than when you are sitting or lying down. A heart patient must have a strict regimen of living in addition to eating. He must avoid stress, worry and excessive physical strain. Arjuna is a special powerful Ayurvedic herb for all kinds of heart diseases. As Ayurveda's heart medicine par excellence, it tonifies the heart and lungs, stimulates blood circulation, strengthens the heart muscles, stops bleeding and promotes the healing of tissues. Arjuna, in proper combination is good for all the three doshas. All people with heart weakness can benefit by this herb, regardless of the nature of their disease. Elecampane is another excellent herb for heart disease associated with Kapha and congestion in the lungs. It is also useful in treating chest pain and high cholesterol. Salvia improves circulation, strengthens the heart and calms the emotions. It is good for angina pain (taken with small amount of cardamom and sandalwood). It is helpful for both before and after heart attacks and is good for thinning the blood. Salvia is particularly useful for Pitta and Kapha conditions, but can be used on vata with warm spicy herbs like cinnamon. The best western heart tonic is hawthorn berries. It improves circulation, strengthens the heart muscle and helps dissolve cholesterol. It also increases longevity. Myrrh is useful for cleansing the blood, clearing cholesterol, improving circulation and strengthening the deeper tissues. Many spices like ginger, cardamom and cinnamon possess circulatory stimulant properties and are great for the heart. They energize the heart, uplift the emotions and promote joy. Sandalwood is a specific herb and essential oil for calming and cooling the heart. Garlic is an important heart stimulant and tonic with rejuvenative powers. It is also known as blood thinner. Turmeric is found to reduce serum cholesterol and blood sugar. Onion is useful in decreasing thrombosis and is useful in reducing serum cholesterol. The Arjun Saar is a unique Herbal Formulation prepared from the bark of the Arjuna Tree. The bark and preparation made from Arjuna are known to have a marked stimulant action on the heart. It acts as an excellent cardiac tonic. Have a low-salt, low-cholesterol (saturated fat) diet. Have foods containing Vitamins and Minerals. Limit salt intake as much as possible. Recommended intake is about 5 gram per day. If you are obese, you are at a greater risk of developing a heart disease. so, try to maintain a normal weight by having a balanced diet and adopting certain measures like walking, avoiding stress etc. Grains - Normal quantity. Even if your breakfast comprises of bread, prefer to have whole wheat bread or brown bread. They are rich in fibre and also safe to consume. Sea foods - fish rich in omega 3 fatty acids are useful in preventing heart diseases. Vegetables - Adequate quantity. Have fibre rich foods. It is much beneficial for both diabetes and heart diseases. But prefer to have green vegetables in moderate quantity as it may enhance coagulation because of the vitamin K constituent in it. Have foods that have anticoagulant properties like wheat germ, soy beans, and sources of vitamin E.
If the person has constipation often, prefer boiled vegetables rather than raw vegetables or salads. Garlic - it is useful for thinning the blood and also reduces serum cholesterol. Turmeric - it helps to reduce the bad cholesterol and blood sugar. Alcohol - it is said consuming little bit of alcohol is beneficial. However it is not advisable. Sometimes it acts as a silent killer when consumed in high amount. Foods high in Vitamin C and E - Amla Saar (a rich source of vitamin C), is rich in anti-oxidants, is beneficial for diabetes, bronchitis; to prevent heart disease, increases immunity and prevents infections. It improves stamina and keeps oneself young. The other sources of vitamin C are citrus fruits, broccoli, cabbage, strawberries etc. Good sources of Vitamin E are wheat germ, oats, almonds, sunflower seeds etc. Tomatoes are a good source of vitamin C and E. however, one who are suggested to prevent tomatoes from their diet due to kidney stones or any other condition can peel it and remove the seeds and consume. Vitamins C, E, B12, and B6 are helpful in preventing the unnecessary formation of clots. Thatsy Cardiologists recommend Multi-Vitamin Supplement depending on the condition of the Patient. Avoid stimulants like coffee. 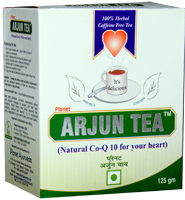 Instead Have Arjun Tea (has co Q 10, which acts as a heart energizer and enables its proper functioning) which is beneficial to the heart. Avoid fried foods, butter, foods rich in saturated fat, processed foods, aerated drinks, soft drinks, ice creams, chocolates, smoking, alcohol, tobacco-chewing, spicy foods, red meat and white bread etc. Can include low-fat diary products and lean meat in moderate quantity instead of whole milk and read meat. Having a balanced diet, Avoiding stress, Regular walk are the best measures to prevent heart diseases. If possible practice Meditation and Pranayama for few minutes.